Welcome to MedTx, a web application providing dynamic CDSS charts aimed to streamline doctor to patient interaction. As an Individual user you are able to use our existing CDSS charts. You can find a complete list of CDSS charts here as well as the sidebar (right) located on most pages. A CDSS chart is comprised of a list of conditions or check lists which you can select if applicable to the patient’s condition. By selecting a line (clicking on a checkbox) and filling in any inputs, the selected text will be used in the generated chart output below the CDSS chart. After you have selected all of the applicable lines to your patient and entered in any relevant information. You can click on “Generate Chart” to produce the output based on what you have selected/filled in. 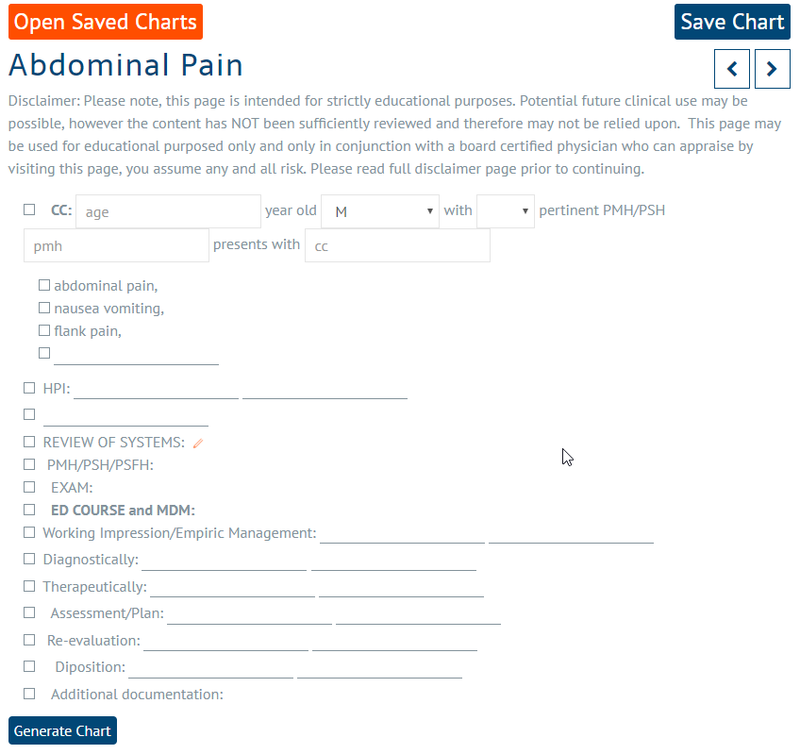 Here is an example CDSS chart and chart usage for a patient that comes in for Abdominal Pain. Select the first line for Chief Complaint (CC:) and fill in the patient’s age, gender, and any pertinent medical history and condition. Select any other pertinent lines for the patient. When satisfied with your selections, click on “Generate Chart” to view a generated text output based on your selected lines/filled in patient information. Note that this data is copied to your clipboard so you are able to paste this output into another application. If you wish to modify the chart slightly to fit your needs you are able to do so using the pencil edit icon which appears when you hover over a line on a CDSS chart. By default there are assumed presets such as “suspects”, “considering”, “endorses”, etc… These are added to the line either on the left or right side (determined by the active arrow). You can also add your own presets which will be saved under your account and appear in your presets. If you don’t want a preset, you can delete it by clicking on the grey “x” icon on the right side of a preset. Set the direction of the added presets by clicking on the preset’s preferred direction arrow. Lastly, you can edit a line freely by clicking on it and modifying the line. If you are not able to finish filling in a chart or wish to continue using a chart on another device, use the “Save Chart” button (blue) on the top right side of a CDSS chart. Once the chart is saved, it will appear in your “My Charts” page. You can open a chart in two ways: Using My Charts or using the “Open Chart” (orange) button on the top left of an open CDSS chart. Under My Charts you are able to manage your saved charts. Here you can open charts, delete charts and search for charts.